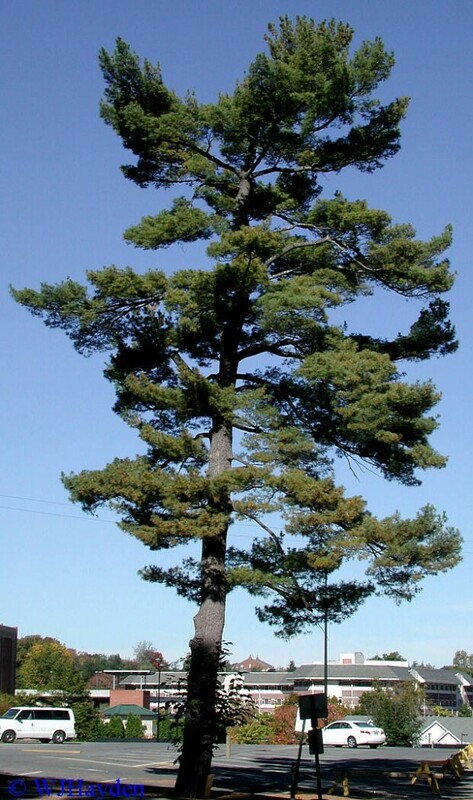 Pinus Strobus.Courtesy W. J. Hayden, Univ. Richmond. facultystaff.richmond.edu. (Accessed 8/2014). Pinus strobus is an evergreen gymnosperm tree to 70 m; lives about 200 years; roots associated with ectomycorrhizae (Berliner and Torrey 1989), including the Basidiomycete fungal species: Suillus granulatus (granulated bolete), Amanita brunnescens (Nantel and Neumann 1992) and Boletinus pictus. Old bark fissured, young stems smooth, somewhat shiny, dark gray. Leaves needle-like, soft, thin, in bundles of 5, about 10 cm, whitish bloom, living 2 years. Flowers: None. Gymnosperm. Monoecious; male cones about 1cm, deciduous, pollen shed before female cones receptive; seed development takes 2.5 yrs. Pollination occurs in small female cones first year, cones grow and mature second season, mature second fall, when seed shed. Mature cones brown, open, about 12 cm long, unarmed, resinous, rather thin, seeds about 2 cm, winged. Seeds require overwintering to germinate. Fruit: None. Seeds winged, eaten by numerous birds and mammals, favored by white-footed mice (Peromyscus leucopus) (Ostfeld et al. 1997). 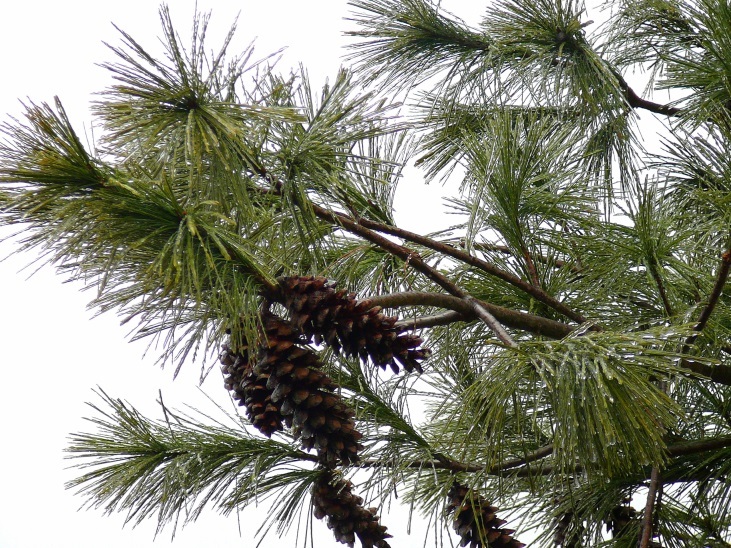 Pinus Strobus.Courtesy W. J. Hayden, Univ. Richmond. facultystaff.richmond.edu (Accessed 8/2014). Frequency in New York City: Frequent. Sites of old gardens, landscaped areas, forest restoration sites, occasionally escapes. Some trees in south S.I. (Clay Pit) may be naturally occurring or escaped from cultivation. Habitat: Soil pH 3.8-6.5 (Greller et al 1990; Hightshoe 1988; USDA, NRCS 2010). Intolerant of salt, flooding, drought. Moderately shade tolerant, needs about 50% sunlight, shade index 4.4 (Hightshoe 1988). Notes: Trees used as owl roosts. Bark and foliage eaten by rabbit (Martin et al. 1951). Attacked primarily by white pine weevil, (Pissodes strobi), white pine blister rust (Cronartium ribicola) and Armillaria root rot (Armillaria mellea), among other insects and diseases (Burns and Honkala 1990; Sinclair et al. 1987; Baker 1949).